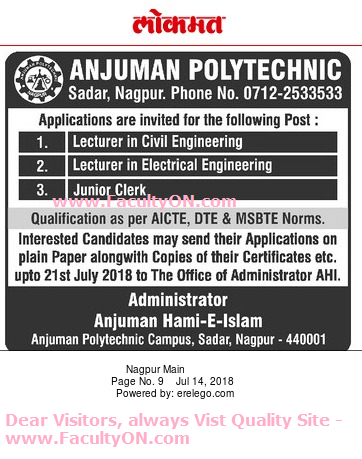 Anjuman Polytechnic, Nagpur has advertised in the LOKMAT newspaper for recruitment of Lecturers / Junior Clerk jobs vacancies. Interested and eligible job aspirants are requested to apply on or before 21st July 2018. Check out further more details below. About College: Our mission is to provide value based Technical Education and to mould the character of the younger generation, through science and spirituality so that their earnest endeavor to achieve prosperity in life and professional success in global environment, by providing affordable access to technical education in the programs offered. How to Apply: Interested and eligible candidates are requested to send their application on plain paper along with copies of certificates and recent PP size photo to the postal address provided below.